Fragment of limestone relief. 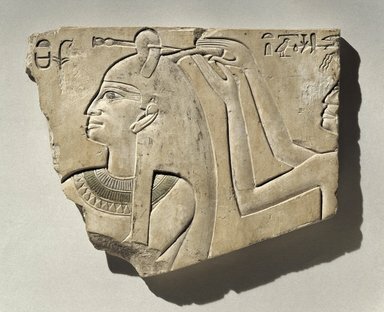 In sunk relief, at right a queen, preserved head to breast; behind her, partially preserved, representation of “the hairdresser Hnnwt” braiding her wig. Queen’s name is lost. Condition: Minor chips on surface, otherwise intact. Colors; remains of black on hairpin, eye and wig. Necklace, register of light blue, then green and again blue. Scattered remains of red guide lines.